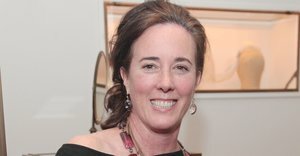 Fashion designer Kate Spade was found dead in her New York City apartment on Tuesday morning of apparent suicide, TMZ reports. She was 55 years old. The NYPD confirmed to Access that Kate was found dead in her New York City apartment by her housekeeper. "Today at approximately 10:20am police responded to a call of an unconscious person at 850 Park Avenue. Upon arrival officers discovered a 55 year old female unconscious and unresponsive. EMS responded and pronounced female deceased at approximately 10:26am.The deceased has been identified as last name Brosnahan, first name Katherine," NYPD told Access. Kate Spade was born Katherine Noel Brosnahan. Kate rose to fame when she and her partner Andy Spade launched Kate Spade handbags in 1993. Their handbag line turned into a women's fashion brand, including clothing, jewelry, perfume, shoes, lifestyle and more. In 1999, they sold a majority stake of their brand to Neiman Marcus, CNBC reported. Kate and Andy married in 1994 and welcomed their daughter, Frances Beatrix Spade, in 2005. Andy is the brother of actor David Spade. Kate and Andy sold their company in full in 2007 in order to raise their daughter. "When we sold the company in 2007, it was really to focus on our family. It really was. It was a grind. I had just had a baby," Kate told CNBC in 2016. Kate later launched another fashion brand, Frances Valentine, which was inspired by her family and named after her daughter.